Your child needs support at school? Homework help and tutoring: our specialty! Our experienced advisors take the time to match a tutor to your child's personality and the difficulties they are experiencing. 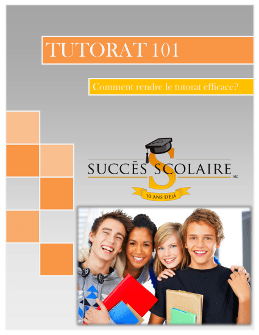 A tutor at School Success is specialized in the subject that they teach. They are familiar with the structure of the current teaching program; its techniques and objectives. Through individual support, the tutor ensures that they are taking a unique approach tailored to your child in order to address concepts seen in class, consolidate what they've learned, prevent them from falling behind or help them catch up, suggest efficient work methods and learning strategies and, if needed, provide further advancement. Hiring a third party (not the parent, or the older sibling, or the teacher) to help with homework offers many advantages. Students are often more concentrated and are more comfortable about asking questions. The tutor can take the time to explain, step-by-step, the concepts that are causing problems, in a personalized way.